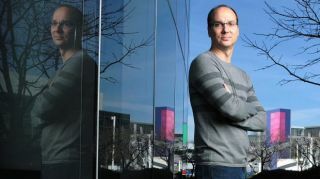 Andy Rubin, the creator of Android, is reportedly working on high-end smartphone that could challenge the industry’s top dogs, including the iPhone and Google Pixel. Sources speaking with Bloomberg divulged the device, which will actually be the focal point of a number of consumer hardware products, including some for the home, created by a new company Rubin has formed called Essential. Essential’s phone, though still wading through the prototype stage, has a number of impressive-sounding features. These include a large edge-to-edge display, no bezel, a ceramic back and the ability to add-on hardware via its charging port. Artificial intelligence also sounds to be a major part of the handset, as it will be in Essential's other products. At least one prototype of the phone has a screen that bests the iPhone 7 Plus display in size, one source said. In addition to its top-of-the-line materials and features, the most intriguing aspect of the phone is its ability to support accessories that plug into its charging port. This innovation would help the device standout in the crowded smartphone world, especially against modular devices, which have so far come up short. It would also give users more out of the phone, allowing them to swap out accessories as needed and utilizing it for more functions than what we've grown accustomed to on the software side. One such accessory that's currently being developed is a spherical camera that snaps 360-degree photos, according to Bloomberg. While today's report offers a trove of details to chew on, one thing remains a mystery: it's still unclear if the phone - or any of Essential's products - will rely on an operating system based on the software Rubin created. Is this just another moonshot? Rubin is best known as the Father of Android, which he sold to Google in 2005. After turning Android over to now-CEO Sundar Pichai in 2013, Rubin moved to moonshot robotics projects before leaving Google in 2014. He went on to start Playground Global, a company that invests in and incubates startups. Now, he seems prepared to launch yet another firm, one with hardware at its core. The wheels certainly seem to be turning for the phone, and according to the report, Rubin wants to put it on sale by mid-year at a cost that goes up against the iPhone 7's $649/£599/AU$1,079 price tag. Will we see this phone, and the rest of Essential's workshop wares, before long? Or is it destined to go quietly into the night, never to be heard from again? With so many key details already surfacing, we're betting on the former.